Objective: To study the morbidity pattern among cotton mill workers. Material and Methods: This cross-sectional study was conducted in cotton mills in Guntur District (AP) in January 2009 to May 2009. Total 474 workers were included in the study. Results: All study subjects were male. Most of the study subjects belonged to age group 30−40 years (56.96%) and lower socioeconomic status (36.09%) according to modified Kuppuswamy's classification. The literacy status was varied with 5.70% being illiterate and 37.13% were educated up to primary school. Most of workers were working in Ring frame (41.56%) and majority (58.44%) were working for the last 5−10 years. Mean height of study subjects was 147.42 cm and mean weight was 55.11 kg. The common morbid conditions found were eosinophilia (18.35%), iron deficiency anemia (28.90%), byssinosis grade 1 (7.80%), dental stains (6.54%), refractive errors (7.80%), chronic bronchitis (4.85%), and upper respiratory tract infection (8.64%). For byssinosis Roach and Schilling criteria  was used. Distribution of study subjects according to demographic characteristic is shown in [Table 1]. 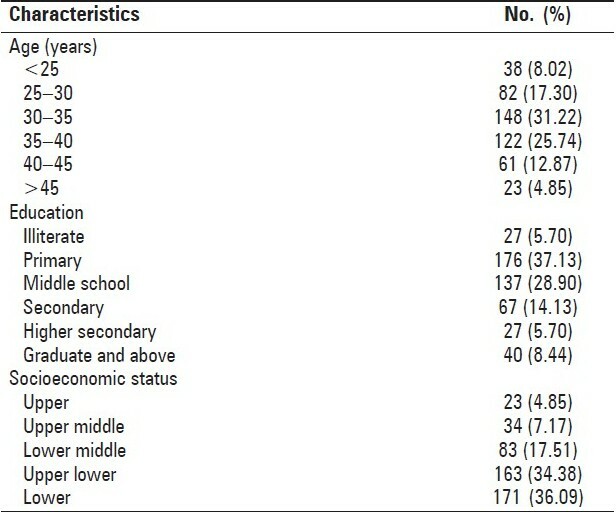 Majority of study subjects belonged to 30−35 years (31.22%) and 35−40 years (25.74%) age group. 37.13% workers had primary education while 28.90% workers had educational attainment up to middle school level. Majority of study subjects belonged to lower (36.09%) and upper lower (34.38%) socioeconomic status according to modified Kuppuswamy's socioeconomic status scale. [Table 2] shows the distribution of study subjects according to occupational and personal characteristics. Majority (58.44%) of workers had considerable duration of exposure, i.e., 5−10 years and that too in dusty departments such as winding, ring frame, speed frame, and carding. Of the total 474 study subjects, only 20.46% were smokers. Distribution of study subjects according to anthropometric characteristics is shown in [Table 3]. The mean height of study subjects was 147.42 cm. Majority (36.50%) of study subjects had height between 160 and 165 cm. Similarly, the mean weight of study subjects was 55.11 kg with majority (38.61%) of study subjects having body weight between 55 and 65 kg. 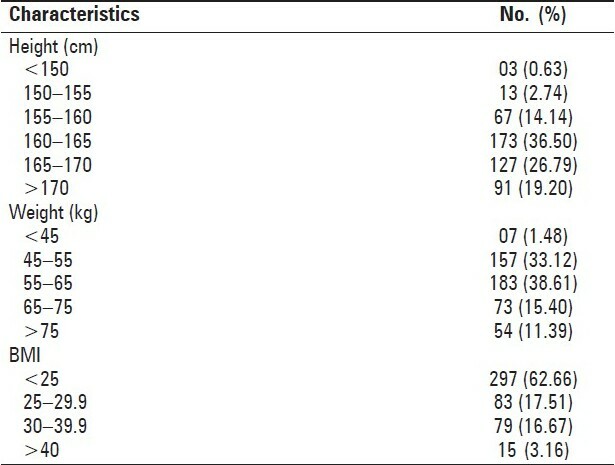 Using body mass index as a parameter for obesity, 37.34% study subjects were found to have obesity of varying degrees. 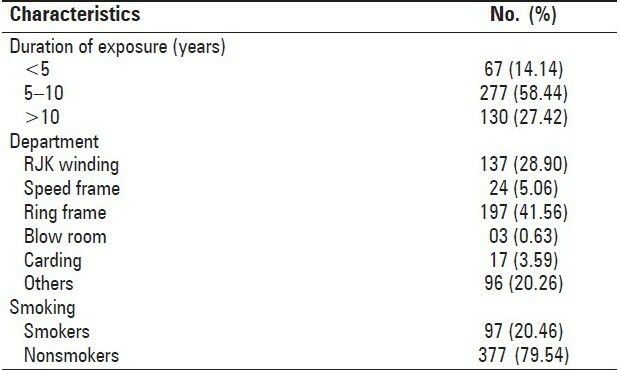 [Table 4] shows the various morbid conditions among workers. 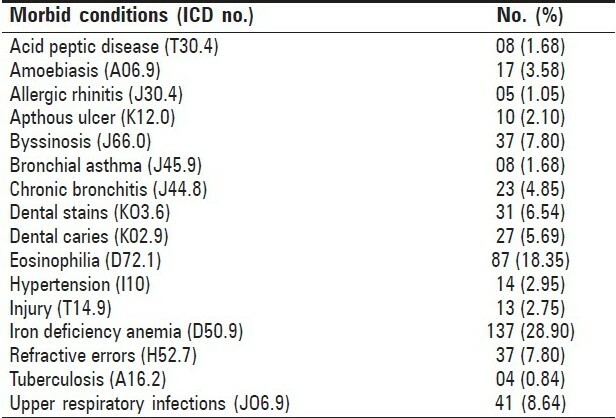 Most common morbid conditions included eosinophilia (18.35%), iron deficiency anemia (28.90%), byssinosis grade 1 (7.80%), dental stains (6.54%), refractive errors (7.80%), chronic bronchitis (4.85%), upper respiratory tract infection (8.64%). In the present study, a respiratory morbidity is due to the inflammatory and allergic response to inhaled cotton dust particles resulting in chronic bronchitis, bronchial asthma, upper respiratory tract infection, and byssinosis. Other studies have also reported similar findings. ,, Allergic response to inhaled cotton dust particles may have been responsible for eosinophilia. High prevalence of dental problems suggests a poor oral hygiene among study subjects. As most of the study subjects belonged to upper lower and lower socioeconomic class, they have poor purchasing capacity, which may be responsible for a high prevalence of iron deficiency anemia among study subjects. The present study indicates a need of health education regarding use of personal protective devices such as mask and other respiratory devices and maintaining high standard of oral and personal hygiene. Tobacco smoking and chewing should be prevented. 1. Park K. Park's text book of Preventive and Social Medicine. 20 th ed. Jabalpur: Banarsidas Bhanot Publishers; 2009. p. 708-11. 2. Raffle PA, Lee WR, Murray R, McCallum RI. Hunter's Diseases of Occupations. 6 th ed. London: Hodder and Stoughton; 1987. p. 690-705. 3. Parikh JR, Bhagia LJ, Majumdar PK, Shah AR, Kashyap SK. Prevalence of byssinosis in textile mills at Ahmedabad, India. Br J Ind Med 1989;46:789-90. 4. Gupta S, Gupta BK. A study of byssinosis and associated respiratory disorders in cotton mill workers. Indian J Chest Dis Allied Sci 1986;28:183-8. 5. Parikh JR, Bhagia LJ, Shah AR, Majumdar PK, Rao NM, Kashyap SK. Chronic bronchitis in textile workers. Indian J Ind Med 1994;40:62-5. 6. Edwards RW,Bouchier IAD.Davidson's Principles and Practice of Medicine. London: ELBS with Churchill Livingstone; 1991. p. 501-3. 7. World Health Organisation. Nutritional anaemia. Technical Report Series No. 409, Geneva: World Health Organisation; 1968. p. 9-10. 8. World Health Organisation. Hypertension Control. Technical Report Series No.862, Geneva: World Health Organisation; 1996. p. 2-10.